In the world of outdoor clothing, apart from Scandinavian-based countries, Canada also holds one of the top places for their winter outerwear. There should be no surprise in that, considering that the country goes through incredibly harsh winters each year, thus making the need for warm and cozy winter jackets a priority. 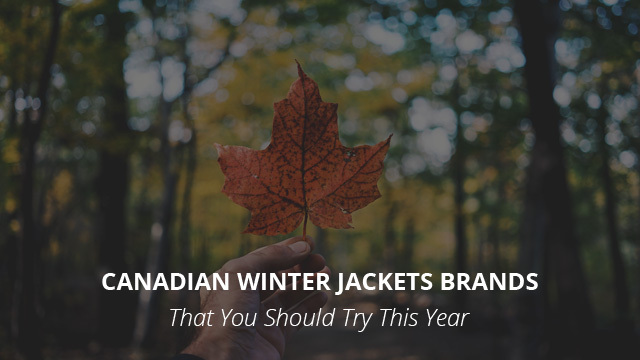 A while back we have scoured through some European countries that design outdoor wear, mainly with a focus on sports’ related clothing, and now it is time to look across the ocean at some of the top Canadian brands for winter jackets that you definitely should give a go this year. We are facing quite low temperatures this winter season, and you are still on time to purchase a warm winter jacket to get you through the remaining months of the season. For this selection, we have picked 11 Canadian brands that design and market some of the best winter jackets for you to try out. Most of these brands are not solely based in Canada, but their production is also done in the country, which almost guarantees a higher quality product and it also lessens the environmental impact. Of course, we will start this selection with Canada Goose, possibly the most renowned jacket brand when it comes to down jackets. The brand was founded in 1957, and it was originally named Metro Sportswear Ltd. It got its current name after the brand began marketing their products in Europe. 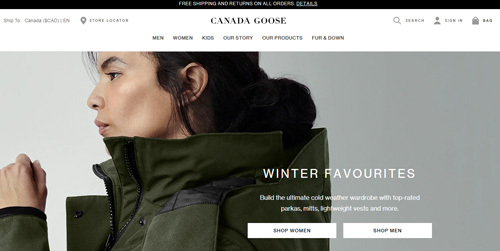 Canada Goose is well-known for its down parkas and jackets and it is the top choice of many people, celebrities and non-celebrities alike, especially in the U.S and Canada. It rose to fame not solely because of the high quality of its products, but also because of an active marketing strategy and its involvement with celebrity endorsements and movie sponsorships. This brand designs arguably the best down jackets on the market, which are made to last for decades and perform like new each time. The next brand is Mackage, a brand founded in 1999 by Elisa Dahan and Eran Elfassy with the simple philosophy that “outerwear is an integral element of fashion”. Their jackets are not only some of the highest quality jackets available, but the designs are some of the most captivating ones. Be it a minimalist jacket, or a beautiful and boasting parka, there is something for everyone in their jacket selection. A brand for those who not only enjoy stylish designs, but are also trying to live a more environmentally-friendly life, Wuxly is not just a brand, but also an effort to help the planet out. This is a vegan brand through and through and its history dates in 2012, when James Yurichuk decided to design his first parka for his girlfriend, after being unable to find one that was entirely animal-free and also made in Canada. The brand is renowned not solely for its beautiful jackets, but also for its involvement in many charities that help out animals and also involved in extensive research on fabrics that outperform down and fur, while being fully sustainable. Another 90’s brand, Rudsak was founded in 1994 by Evik Asatoorian. Their designs are centered around elegance and being contemporary, by using the highest quality leathers, fabrics and furs, which showcase the hard work of the brand’s artisans and craftspeople. Its products retail in more than 30 branded boutiques but those who cannot purchase it locally can always rely on their online store. Options for men, women and kids are all available, so that you and all of those you love can be safe and cozy this winter. Their trims are worthy of noting, as there are options in more than one color, which is something that we have rarely come across in parkas. And if you are on the market for accessories or even footwear, stylish designs are available for purchase on their page. 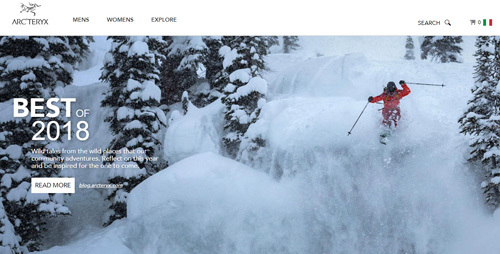 A brand renowned for its outdoor sportswear, Arc’teryx was established in 1989 in North Vancouver, British Columbia. Similarly to many other sportswear brands, Arc’teryx started out with climbing gear and then expanded its product range to sportswear and backpacks. One of its most popular products is the Vapor harness, and then the brand moved on to design the Bora backpack, which used the same Vapor technology. In regards to jackets, winter jackets and technical performance ones are part of their highest-selling products. Nowadays you can find numerous different products in their stores, both locally and online. Kanuk is another Canadian brand based in Montreal, which was established in 1970. Their products are made for protection against the elements and each of their designs has a simple philosophy behind it “they should be made in the climate for which they were created”, which is why Kanuk is a favorite brand of Canadians when it comes to winter jackets. Their jackets are designed to be both practical and protective, the latter bearing the most importance and despite the times and the styles changing, these winter jackets continue to remain one of the best choices for withstanding the harsh Canadian winters. 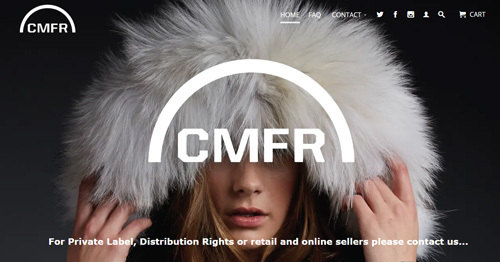 A brand with a special focus on style and color, CMFR designs beautiful winter coats for men and women, made of the highest grade of duck down insulations. Lightweight and in a modern style, their parkas are warm and toasty, capable of withstanding Canada’s frigid winters. Whether you enjoy simple designs and classic colors, or you love bold colors on your parkas, you are sure to find a winter jacket to your liking within CMFR’s collection. Part of the original Outdoor Survival Canada (OSC) brand, the Outdoor Survival Canada Cross line was designed for making down jackets accessible during milder weather and not solely for harsh and cold temperatures. Because the brand itself is renowned for its high standard when it comes to the quality of their jackets, they strived to maintain the same standard with the OSC Cross line. Their products are Canadian-made and based on an expertise of more than 30 years. Their classic and modern jackets are worthy of consideration if you are looking to take your wardrobe up a notch. A brand that designs gorgeous winter parkas for freezing temperatures, Arctic Bay mixes together Canadian expertise in dealing with terrible winters and the highest quality of fabrics, coyote and beaver fur trims, leather accents and high fill-power down insulation. In their product range you will be able to find designs for men, women and children, including different accessories. 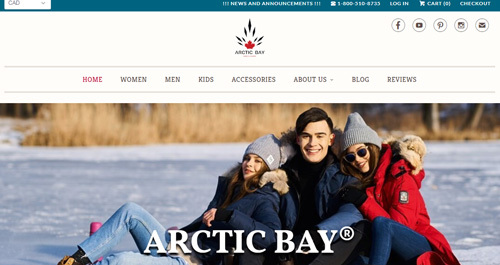 Similarly to the other Canadian-made brands, Arctic Bay, too, falls in the range of luxury brands, for its high quality and its high price. 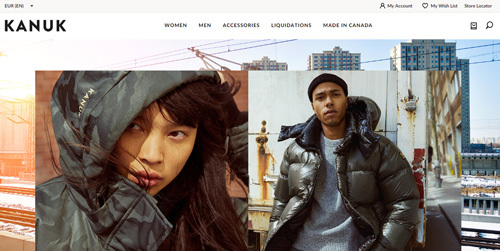 Aritzia is a brand for women-only products and they offer a wide range of outdoor wear, from summer clothing to heavy winter coats. Focusing on the latter, their winter coats and vests are refined and very modern, suitable for daily wear, to keep you warm and cozy regardless of how cold it gets during the day. It was founded in 1984 and its headquarters reside in Vancouver, British Columbia. The brand itself sells in-house brands, within which can be found a variety of jacket styles and other clothes, ranging in warmth, weight and length. The TNA jackets are the most suitable for harsh winters and their bold colors are a must-have for those looking to add some color to their winter outfits. Founded in 1997, Quartz Co. has established itself as a premium Canadian brand for winter parkas, which bring the best combination of quality and performance. Modern designs that can be worn out in town and functional, well-insulated ones to wear out in nature, their parkas are versatile, stylish and long-lasting. In classic parka fashion, they offer designs of various lengths, weights and number of pockets, so whether you need a minimalist style or a parka for practicality, you are sure to find exactly the one you are looking for in their product range. Previous Article← The North Face vs Patagonia: Which Brand is Better?